On the 4th of July I decided that we needed some sort of dessert and I wanted to use only what we had in the house. I looked in the fridge and saw that we had farm berries and butter. I quickly looked in the cabinet to make sure we had brown sugar, flour and oats. I grabbed cinnamon, nutmeg and salt from the spice cabinet. 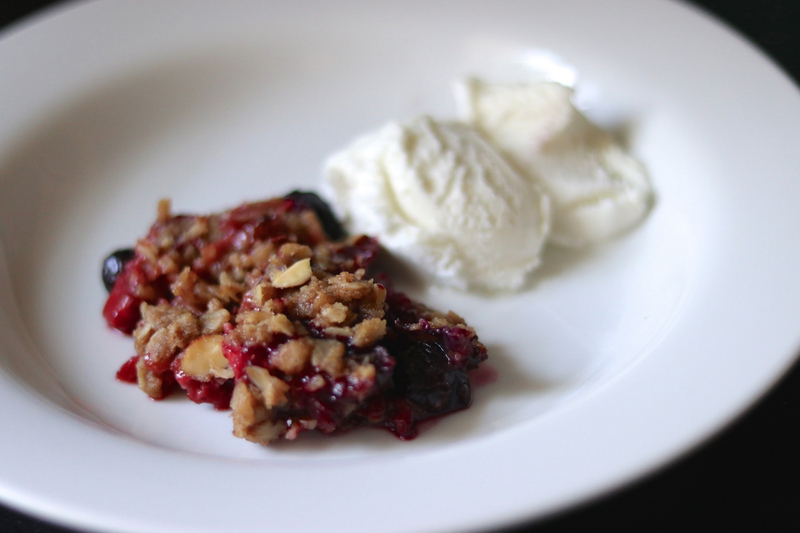 To my delight we had all of the fixings to make a summer berry crisp! This takes a little bit of time (just to cut up the strawberries) but these recipes are such an easy thing to put together and the end result is just amazing! I will be making the recipe again soon so that I can really tell you what I did and the measurements I used. Last night I was truly just winging it because I wanted something festive for the 4th! I washed and slices the strawberries and put them into a glass bowl. I washed the blueberries and got the remaining stems off of the berries and put them in the same bowl. 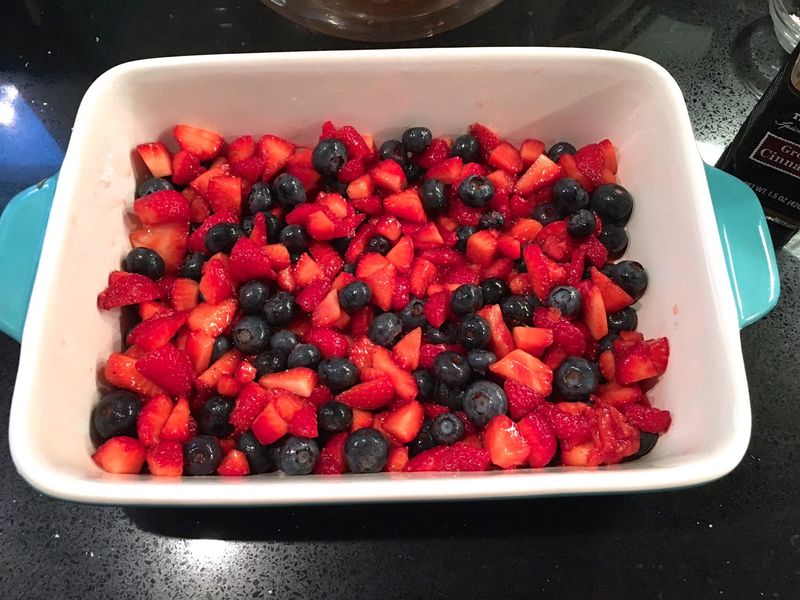 I sprinkled about a tablespoon of brown sugar directly onto the berries and added a pinch of cornstarch and a tiny pinch of salt to the mixture. I sprinkled a couple of shakes of cinnamon onto the fruit and stirred everything around. 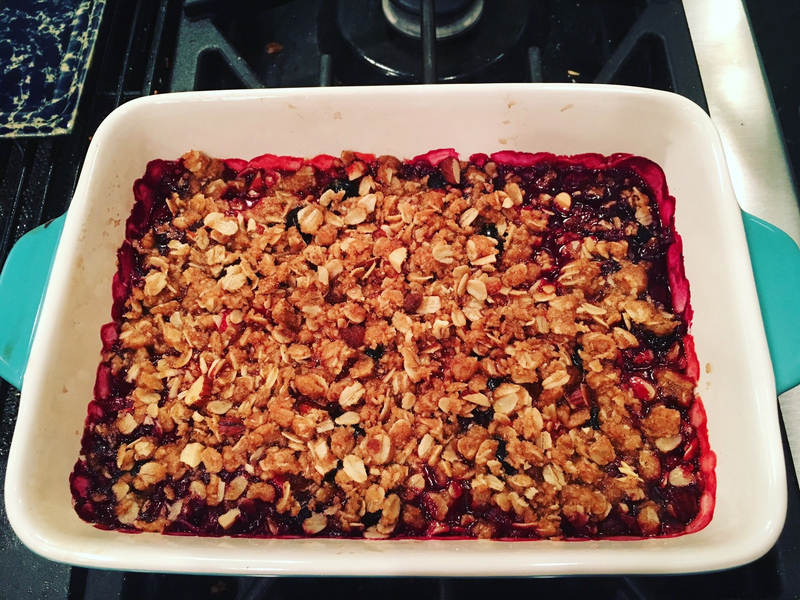 I pre-heated the oven to 350 – this is the only sad thing about making a berry crisp on a hot day. Thankfully it was starting to cool off outside, so I was able to open the windows to let some of the heat from the oven escape. In a separate bowl I added approximately 1/3 C of brown sugar, 4 tablespoons of cold butter (cut into 1 inch cubes), 1/4 C of flour, and 1/4C of oats. I mixed the crumb topping together and pinched the butter with my fingers to mix it into the rest of the topping. Eventually I added a pinch of kosher salt and a teaspoon of cinnamon and 1/2 a teaspoon of nutmeg into the mixture. 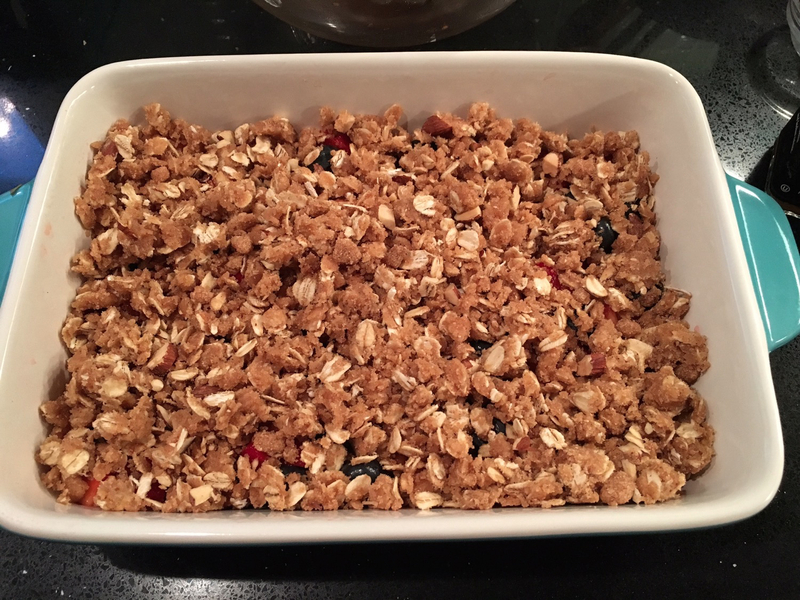 Once I was done mixing the topping, I decided to slice up about seven almonds and mix that in as well – it turned out to be a great addition. The crisp baked for about 28 minutes in the oven at 350 degrees. I took it out once the topping was browned and the fruit mixture was bubbling. We ate the crisp while it was still warm (after having a grilled hot dog and grilled zucchini and carrots off of our charcoal grill for dinner). We each had a scoop of vanilla bean frozen yogurt with the crisp and it was just perfect! This really looks delicious! I must try it. Marilyn- it is so good and so easy! Vanilla ice cream is perfect with it too. Or whipped cream.